Over 200 years old, 'Chez Manon' is a fully restored 18th century Provençal farmhouse, near the market town of Apt in the Vaucluse. 5 m x 10 m heated swimming pool and professionally landscaped gardens. Separate outbuildings with laundry and covered parking. 2 bedrooms with queen-size beds and en-suite showers, a 3rd bedroom with queen-size bed, a 4th bedroom with two twin beds, a 5th bedroom with single bed and trundle. In total: 4 baths/showers. 3 separate WCs. Large, oak-beamed ceiling, open plan living room, dining room, kitchen. Separate cosy living room with satellite TV, DVD player, & stereo. Internet enabled PC plus WiFi. Fully equipped gourmet kitchen. Linens & towels included. Mid-week cleaning included. Two wood burning fireplaces with wood included. Geothermal under-floor heating, with cooling option. Utilities included. Free internet telephone to over 100 countries. Baby high chair and cot available. 4 bicycles with helmets. Possibility for in-home catering. One bathroom with glass-enclosed tub & shower, one walk-in shower room, two ensuite walk-in shower rooms. Each with sink, mirror, hairdryer. Three separate toilets: two upstairs, one downstairs, each with hand basins. On the northern slop of the Luberon mountain range. Down a private driveway, in its own private grounds, surrounded by fields, but only 2 kms from downtown Apt. Telephone is provided through the internet with free calling landline-to-landline to about 100 countries (including Europe and North America) plus free calling to mobile phones in France. No air-conditioning per se, however, the under-the-floor geothermal heating system allows for cooling to 5 degrees C below ambient. Bed linens provided with weekly changeover included. Electric clothes dryer in the laundry room plus indoor drying racks and outdoor clothes line. Large, open provencal style fireplace in the open plan living room area, plus enclosed wood-burning fireplace in the TV area. Internet is provided through Orange with a Livebox in the library that connects a PC, monitor and printer. Bath towels, wash cloths, hand towels and pool towels provided, as well as terry cloth bathrobes. WiFi throughout with additional routers. Open plan living room with sofa and easy chairs by open provencal-style fireplace. LG side-by-side fridge/freezer with ice and water dispenser in the door. A second tall refrigerator in the laundry room. The stove top of the Rosiere 'Paul Bocuse' range has four gas burners and a grill/warmer plate. The Rosiere 'Paul Bocuse' range has two electric ovens as well as stove-top gas burners. Miele 900 W programmable microwave. Drip filter and an expresso machine. This is a self-catering property. We provide a variety of spices. Groceries can be supplied upon receipt of a list. Plenty of dishes, glasses, cutlery. Open plan kitchen with granite-top surfaces, central island, plenty of pots, pans, utensils, small appliances. The dining area is adjacent to the open plan kitchen. Tablecloths, cloth napkins and plenty of dishes, glasses and cutlery. French and British channels as well as British radio. A wide selection of CDs available. CDs of pop and classical. Assortment of DVD movies and television programs, including some for children. Professionally landscaped grounds with dry stone walled terraces on the south side, cherry orchard on the east side, 'secret' garden with double hammock on the north side, water fountains. Stone flagged terraces front, back and west side of the house with tables and chairs. The north terrace has a vine-covered overhead trellis. The ground floor is accessible but the bedrooms and bathrooms are only accessible by stairs. 10 meters by 5 meters, heated. Available mid-May to mid-September or by request. Solar-powered electric safety cover. Lounge chairs, antique iron beds, sun umbrellas. Chez Manon is ideally suited for those who love to entertain, cook, or just relax. Families with children or groups of friends can enjoy being together or having their own space. You are in the peace and quiet of the countryside, yet only a few minutes from town and within easy distance of some of the loveliest, most interesting places in Provence. This was our fourth annual visit. This is an excellent, well maintained property in a central location for getting around the area. The owners are very accommodating and available if necessary. The property is private, with large outdoor areas. Highly recommend. This is our fourth visit and we would come back again. Lovely property, in a central location. Very well maintained. Laurie is an excellent owner, who is always available. Instructions and helpful information are in English which is very useful. Overall we had a five star two week vacation. This comfortable house, clean house was loaded with everything you could ask for in a self-catering property, from inflatable pool toys to portable room fans to every cooking utensil you could think of to bee repellent around the pool. There is plenty of room, inside and out, with your choice of two terraces to dine on. The kitchen will impress anyone who is into cooking, with plenty of instructions on how to work everything. Wi-fi works well throughout the house, even in the upstairs bedrooms. The house is located high in the hills around Apt, with spectacular views, though it can get a little tricky finding the house again once you leave for the day. Keep the directions in your car! 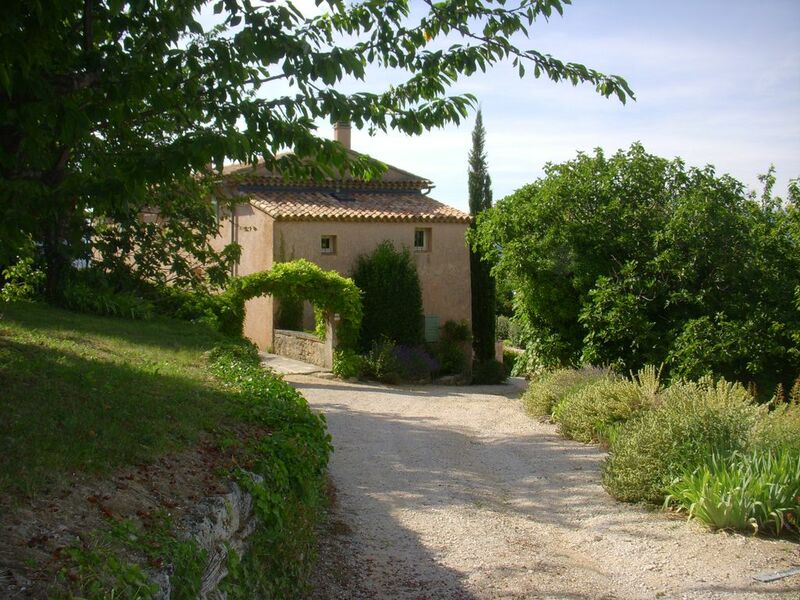 The location is perfect for visiting the famous Luberon hill towns such as Rousillon, Bonnieux and Lourmarin. Apt is a good size, with plenty of restaurants, supermarkets, pharmacies, services and a big market on Saturday mornings. It's not as quaint as some of the nearby charming little towns but has everything you need. The pool is heated and well maintained; we saw the pool cleaner twice during the week we there. The housekeeper, Arlette, lives nearby and was most helpful. In fact, on the first night we arrived we asked her to prepare a simple meal, which she did and was paid extra for. All in all a relaxing stay in a comfortable house with great views. Thank you! Merci! So glad you enjoyed your visit. Please come again. We spent a fantastic week in this beautiful farmhouse in July and did not want for anything. The fully equipt kitchen allowed us to share many meals together and we found the shopping in the local town of Apt amazing. The Lavender festival was in full swing and the people we met were very friendly even though we did not speak French. We visited the near by towns of Gordes, Roussillon, and Sault - all definitely worth a visit. It's also not far from Aix en Provence where we had lunch at Villa Gallici. Thank you so much. Please come again! This was our fourth stay and we recommend this lovely house for all its comforts, views and easy access to the nearby sights . A stay here leaves you delighted with the simple pleasures of life that typify France . Always a joy to return to this peaceful tranquil house that revives and rejuvenates the soul ! We discovered this gem through a recommendation and were pleasantly surprised how idylicc the loacation and facilities are. One cannot want for anything and the proprietor has thought of every eventuality to ensure the complete comfort of the holidaymakers. Our large group thoroughly enjoyed the pool and the surrounding landscaped gardens. The covered terrace was a witness to sumptious culinary creations from the fresh produce available locally. The grand facilities offered will remain etched foreverin our hearts. we will certainly be visiting again. Thank you so much for your great review. We look forward to welcoming you again at Chez Manon. The Luberon national park is in the Vaucluse department, known for its lavender fields, outdoor village markets, antique markets, Roman ruins, outstanding restaurants, hiking paths, hilltop villages, vineyards, and proximity to the shopping and tourist attractions of larger towns such as Aix-en-Provence and Avignon. These rates are priced in euros. Rates are subject to change prior to booking. The heated pool is usually available mid-May to mid-September. Please ask if you would like the time period extended.